The grapes for this wine are from the warm region of Puglia. 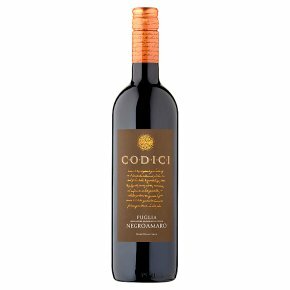 This perfect climate for growing the traditional red Negroamaro grape results in a wine full of ripe berry fruit flavours and a hint of spice. An intense red colour wine whose aroma is rich in notes of spices and ripe fruits. Harmonious and persistent, on the palate it reveals a full and round body.